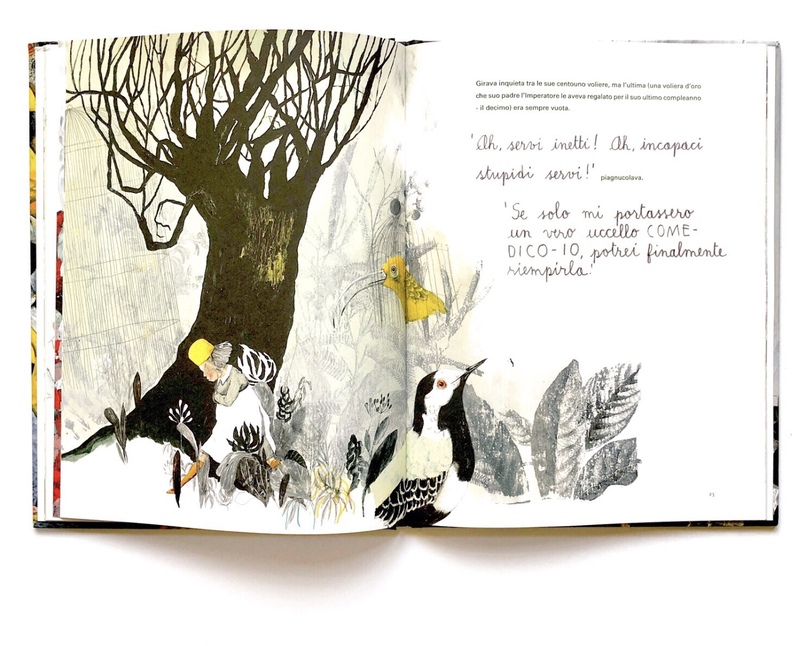 "The freedom of the illustrator is everything that is not written in the text"
Witchfairy (Hexenfee, 2017) and The Golden Cage, Or the true story of the bloody princess (La voliera d'oro, 2015) are both tales about rebel girls in disguise: a fairy and a princess. 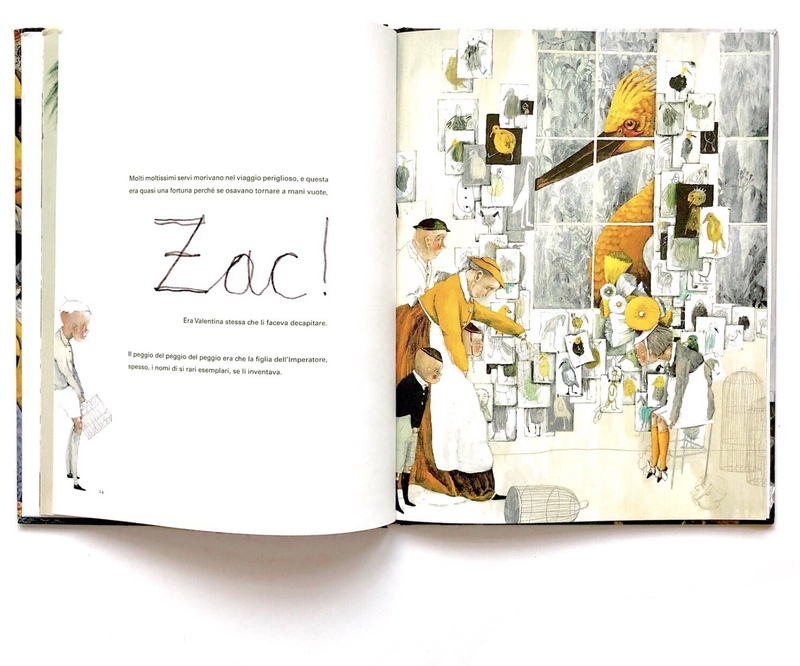 Both have been illustrated by award-winning Flemish illustrator Carll Cneut, a couple of years apart from each other. 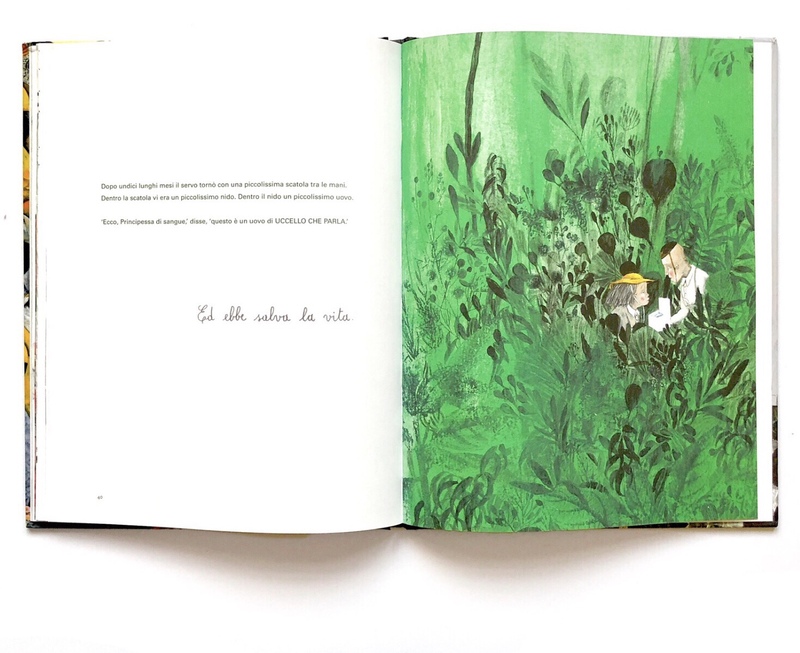 Both stories were written as fairy tales about two offbeat female characters, then gained a much broader meaning and unconventional look thanks to Cneut's utterly sophisticated illustration style. 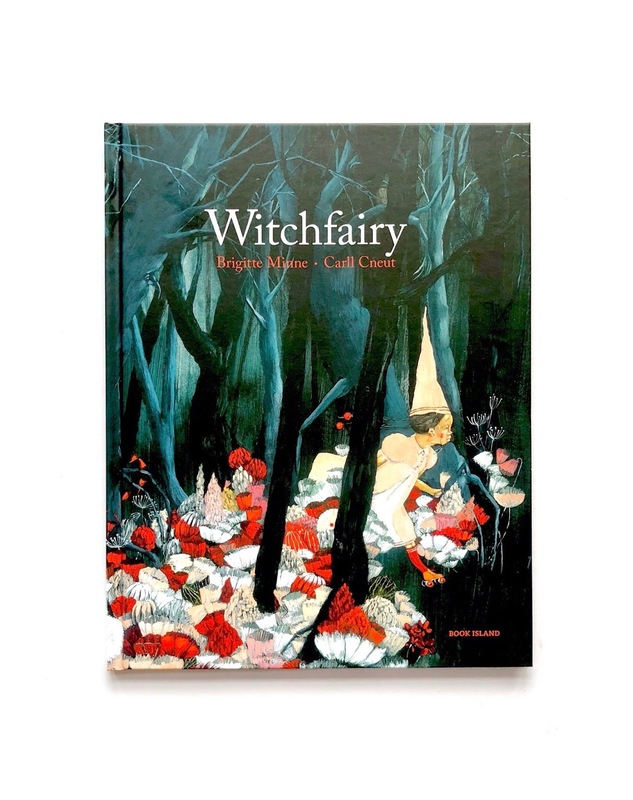 Witchfairy was first published back in 2000, then Cneut decided to illustrate the story again from scratch bringing it closer to the way his style had evolved in time (which tells us something about his perfectionism) and the English and Italian editions were out in 2017, published by Book Island and Topipittori. 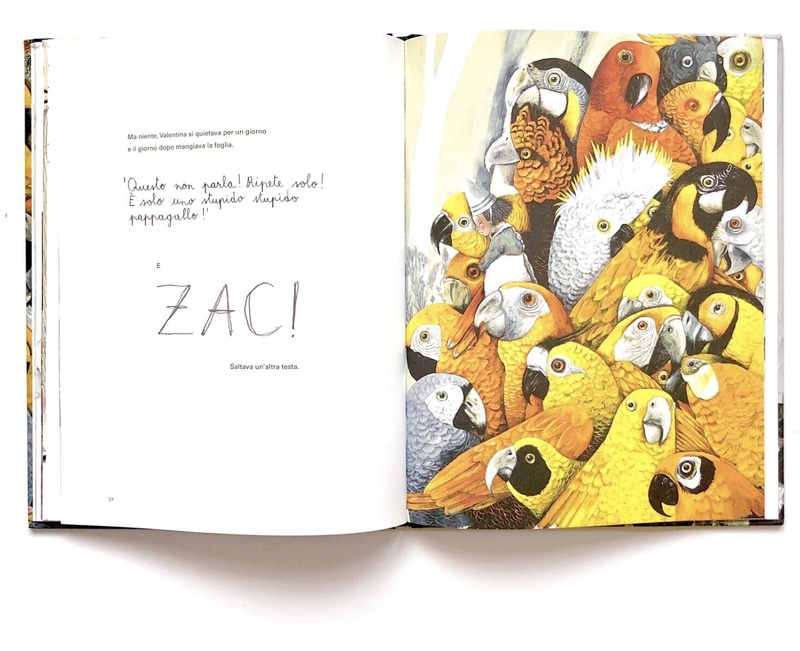 The Golden Cage was published in Dutch in 2014 and in Italian in 2015: the album came with the activity book How to Draw Birds (Uccelli da colorare e disegnare), sold separately. It took over a year to illustrate them. It's a slightly dark, more irreverent story (some beheadings are involved:), probably too much for some markets as it's not been published into English to date. in a castle in the air with golden turrets. For her birthday, her mum gave her a magic wad. "The Emperor's daughter was called Valentina and she was unbearable. She had three hundred and ninety pairs of shoes. Eight hundred and twelve hats. Fifty snake tail belts. 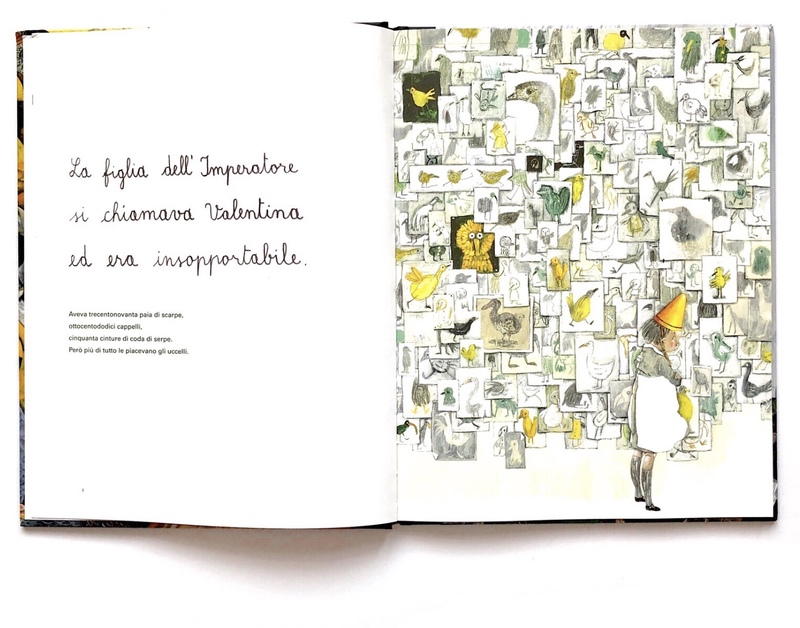 But she liked birds more than anything"
Rosemary and Valentina are not quite like any other fairy or princess: they are just two (very elegant) contemporary girls of unconventional beauty, with angular faces, a large forehead and an unexpected light brown skin tone. In their unwearying search for happiness, they both wear stylish, cool hats. Rosemary is bored to be a fairy, she would like to be a witch instead. She is just like any other child: she wants to be free to play, climb on trees, get dirty, make crumbs while eating, laugh out loud, roller skate and sail boats down the stream. As her mum rejects her, she decides to leave her castle and moves into the witches' wood. The witches turn out to be kind and friendly people, and Rosemary has fun like never before. As it gets dark and she prepares to spend her first night alone far from home, Rosemary's mum decides to join her in the wood, worried about her prolonged absence, finally acknowledging, accepting and even embracing her daughter's new lifestyle in a very necessary, truly happy ending. 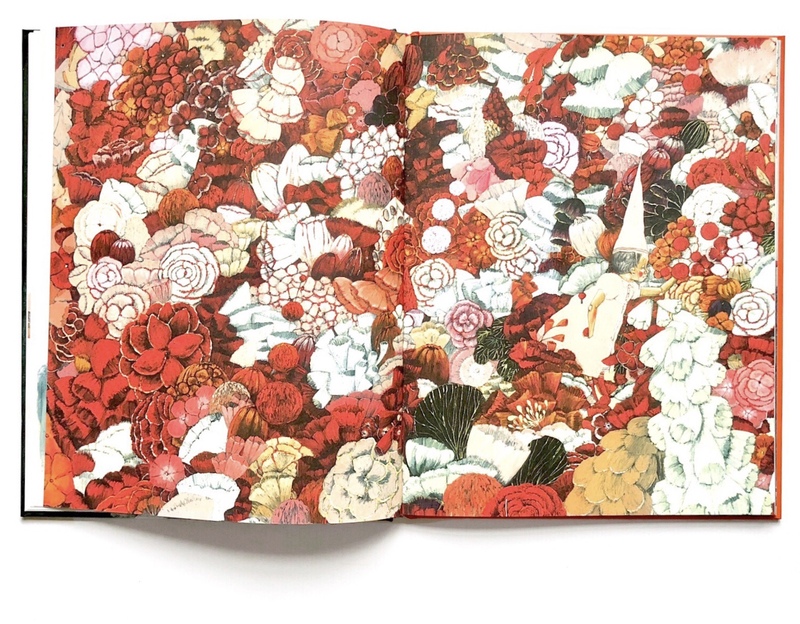 We liked this book (a lot) for a few reasons. 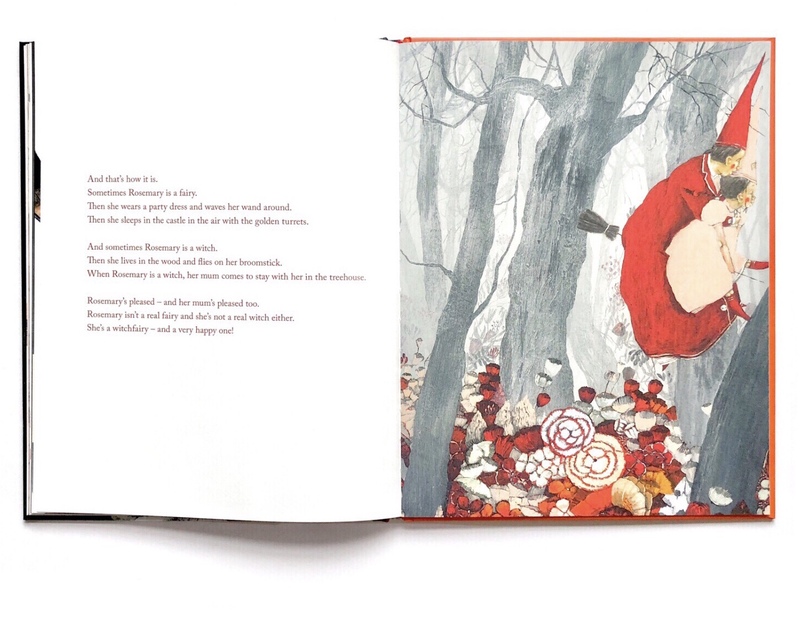 ~ Words and images work together on different levels to play with the stereotypes with humour and elegance (we are quite far here from Bethan Woolvin's unorthodox, defiant, angry interpretation of traditional fairy tales). 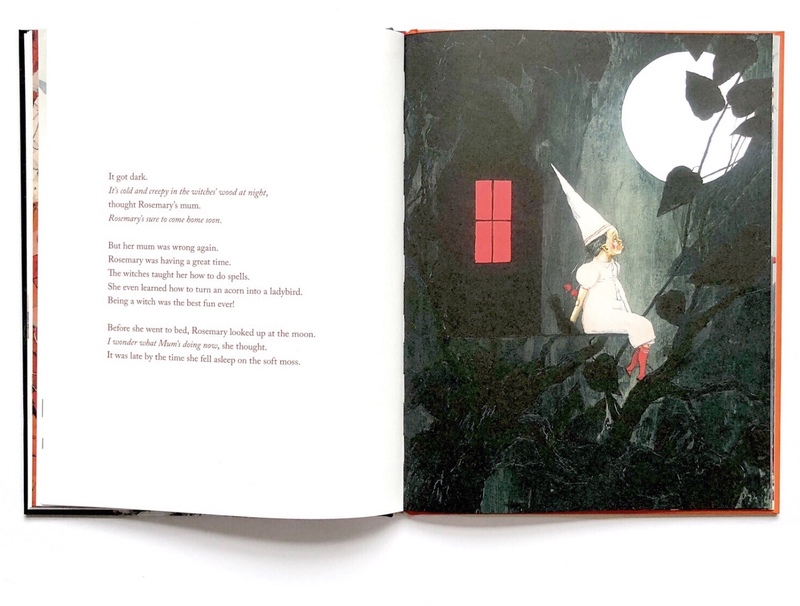 Rosemary lives in a "castle in the air with golden turrets" which is vaguely painted in the first pages, a small grey piece of architecture floating on the white page, as opposed to the richly coloured, lively witches' wood. The separation between the fictional fairy world and the witches' down to earth natural world is marked by a couple of elements only: the witches nose (fairies and witches look otherwise exactly the same, outfit included) and the palette. This matches Rosemary's pink dress when she is in the fairy world with reds, oranges and off-whites, and clashes with it when she is in the woods with blues, greys and greenish tones. The pink dress itself, which was the starting point to develop the colour palette (as a fairy, the dress had to be pink) is not a classic fairy dress, it's in fact contemporary and stylish. 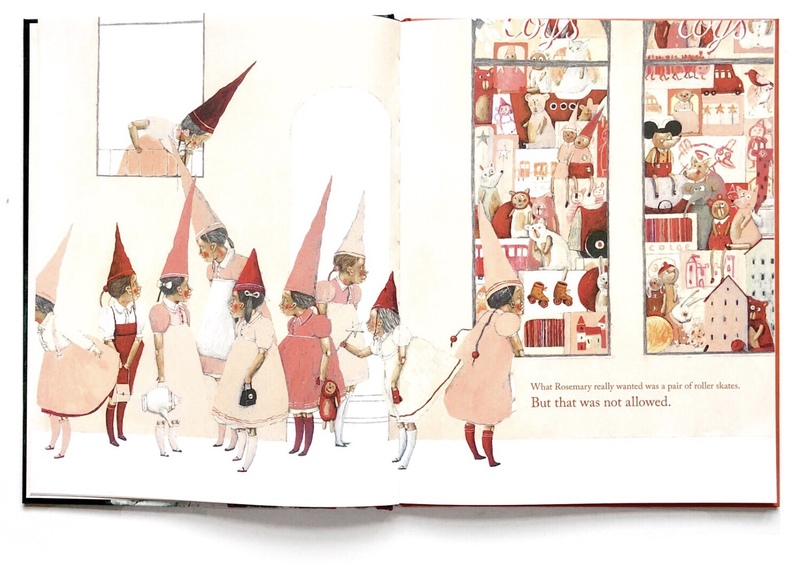 The long pointy hats are the one item that refers to classic fairytales imagery. ~ There are three levels of narration: the author's, the illustrator's and the reader's. Cneut fills the blanks left by the words, sensibly leaving some space for the reader's interpretation. 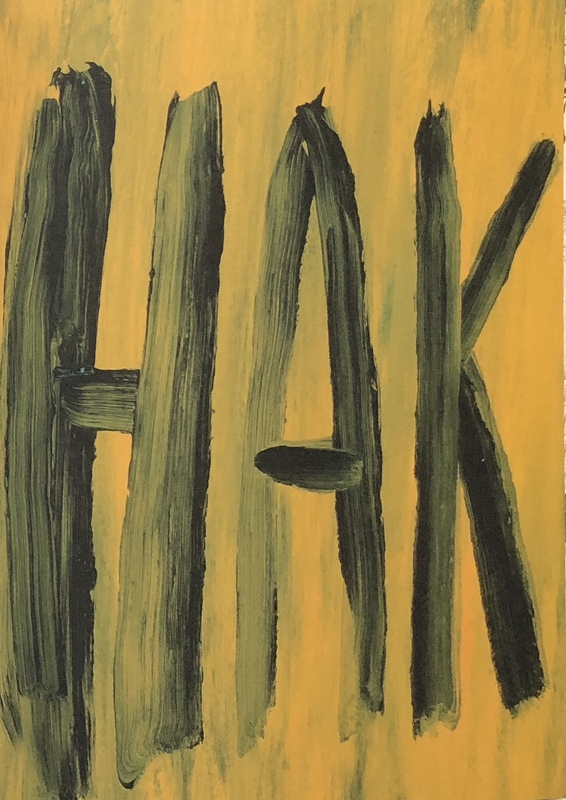 This aspect, the ability of both author and illustrator to take a step back and remain silent, is even clearer in The Golden Cage thanks to a different page layout and to the use of lettering, hand-painted by Cneut himself. 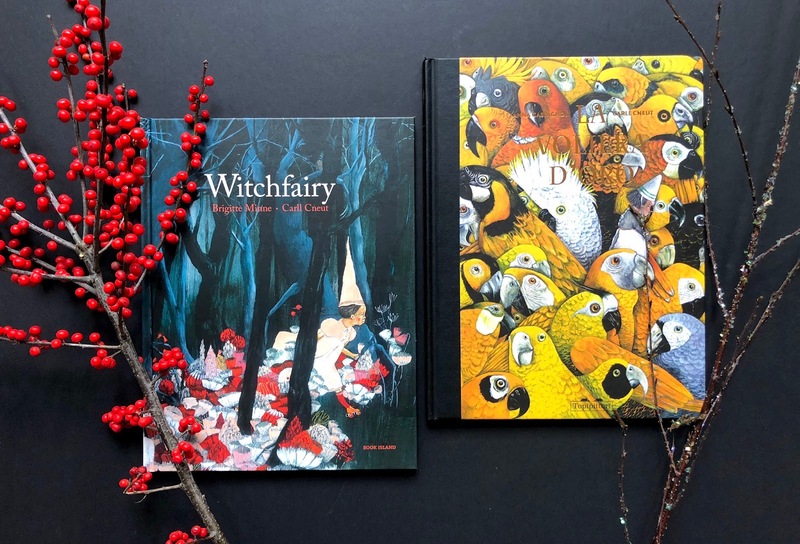 For more insight about the creative process behind Witchfairy, watch the publisher's interview to Carll Cneut in his studio in Ghent (video below). ~ Witchfairy is a positive story about growing up and developing our own identity beyond stereotyped role models that might be set by the family or by the society. Rosemary is a self-confident, persistent girl, but she is also a child missing her mother as she is separated from her the first time. It's also ultimately a story about unwavering acceptance and love, as it endorses a parenting model based on attachment and open-mindedness. ~ The art is stunning. Cneut paints with acrylics from dark to light (every single item in the image), starting from a brownish ground and adding layers of lighter tones of paint. This is an extremely time consuming technique that allows to play with the light in a more sophisticated way, adding depth to the spread. Therefore, art plays a role while reading, asking for breaks to examine the images, to enjoy them and make questions. 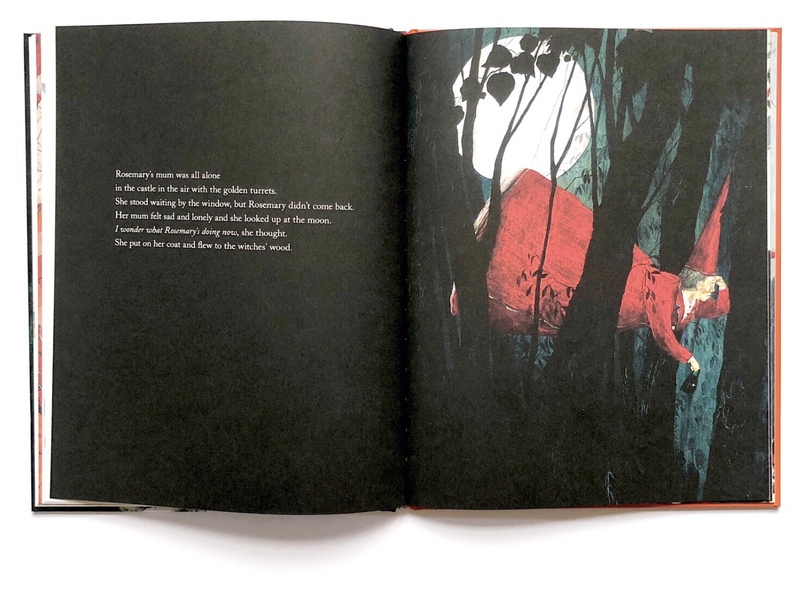 The illustrations don't just silently accompany the story. The visual stimulation keeps children alert, they are educated to beauty and to different aesthetic standards. Which is the whole point really of a reading a well-made picture book. Don't get me wrong, we have been reading both these books before bed (my daughter always asks for Valentina and Rosemary together) and they work just fine, they are just not that type of quick bedtime story if you are in a hurry to tuck them in, so allow some quiet time to read them. 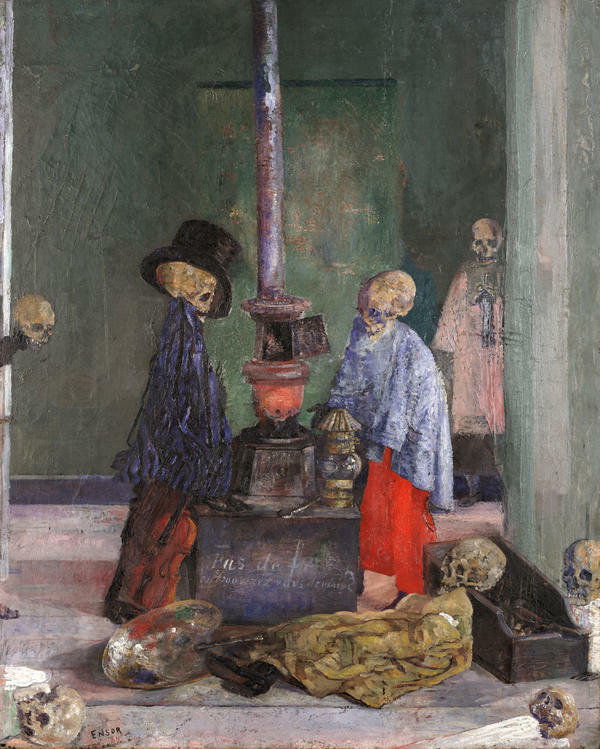 Some of the names behind Cneut's inspiration: Pieter Brueghel, Hieronymus Bosch, Anthony Van Dyck, James Ensor, Adrian Ghenie. 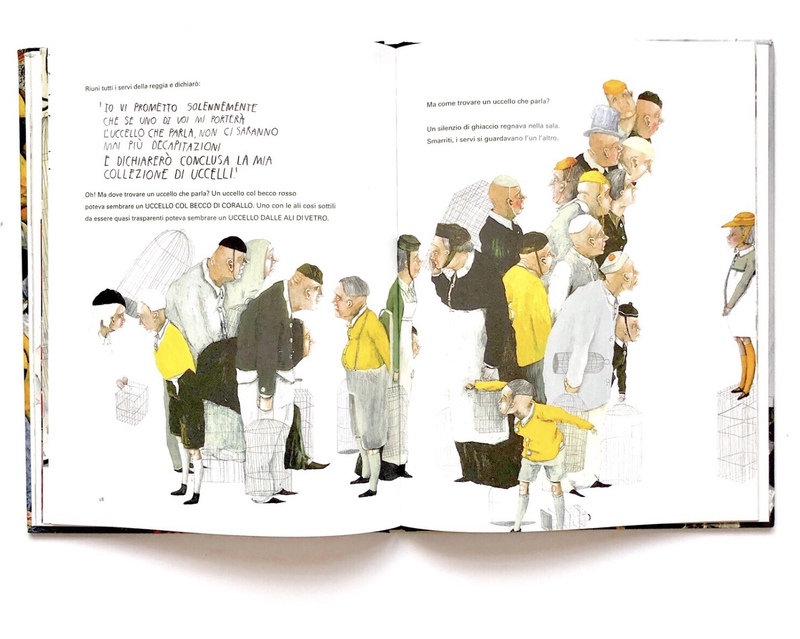 French-Italian author/illustrator Anna Castagnoli met Carll Cneut in Italy a few years ago, and desperately wanted him to illustrate The Golden Cage. "The Golden Cage is a fairy tale that I wrote in one evening, after months where I would wake up with these words in my head: "The Emperor's daughter was called Valentina and she was unbearable." 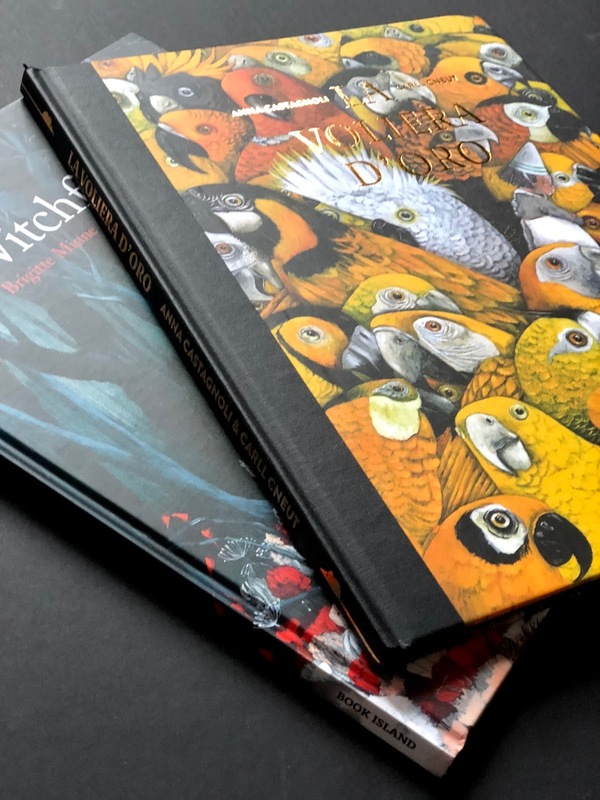 When I finished writing, I thought I would never be able to illustrate the colours, the foliage, the wonderful Toucans, Malakohes with green beaks, Hoopoes of the Nile, the Lira birds I had seen in my imagination. 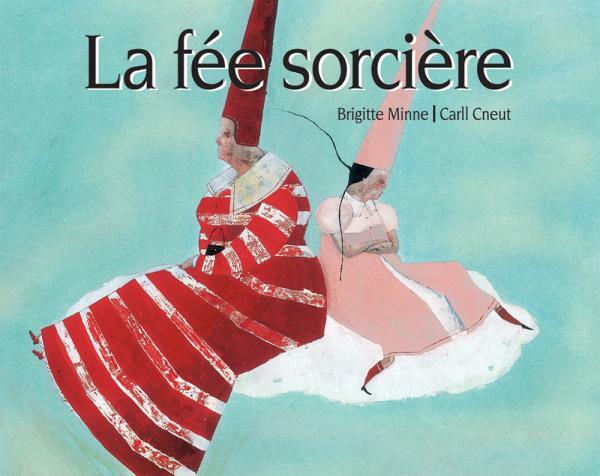 I sent the fairy tale to Carll Cneut: his style was perfect for my story. The following day I received an email from Carll saying "I'll do it". 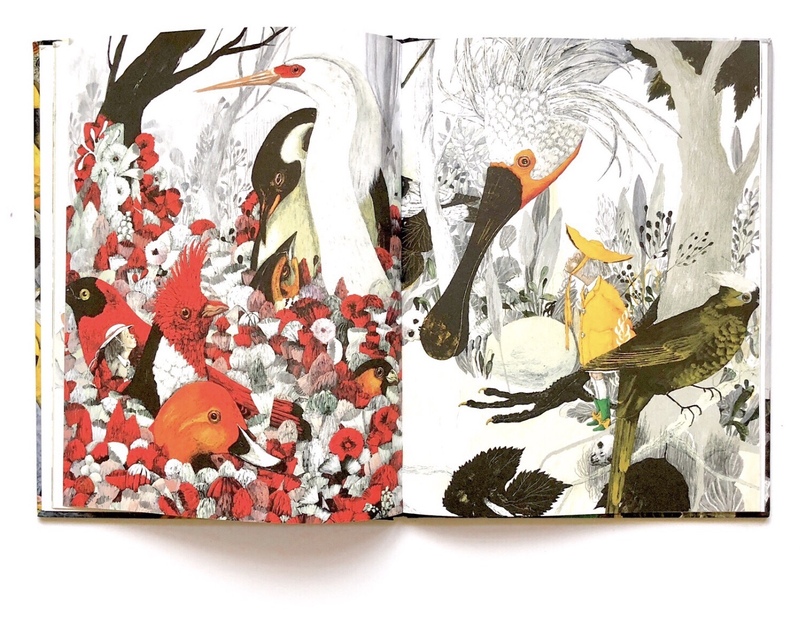 Carll Cneut, Belgian, is one of the most talented and illustrious contemporary illustrators. His books are translated into many languages ​​and he won countless awards. I remember jumping at home all morning. When, several months later, Carll sent me the first sketches of Valentina, I was moved. It was her. She couldn't have been any other way: nervous, unpleasant, extremely elegant"
Valentina is a moody, spoiled princess who wants everything, often things too big for her. She has a real passion for birds, and she sends her servants off to the most remote places on earth to catch the most beautiful birds with the most imaginative names. When she can't get what she wants her frustration dyes the tale a blood red, as her servants are beheaded one after the other, unable to find the very last bird that she terribly needs: The Talking Bird. One day a boy brings her an egg. Inside the egg, he says, there's The Talking Bird. But can that bird really talk? We are left with an open ending, illustrated with cursive handwriting painted by Cneut himself on white background. 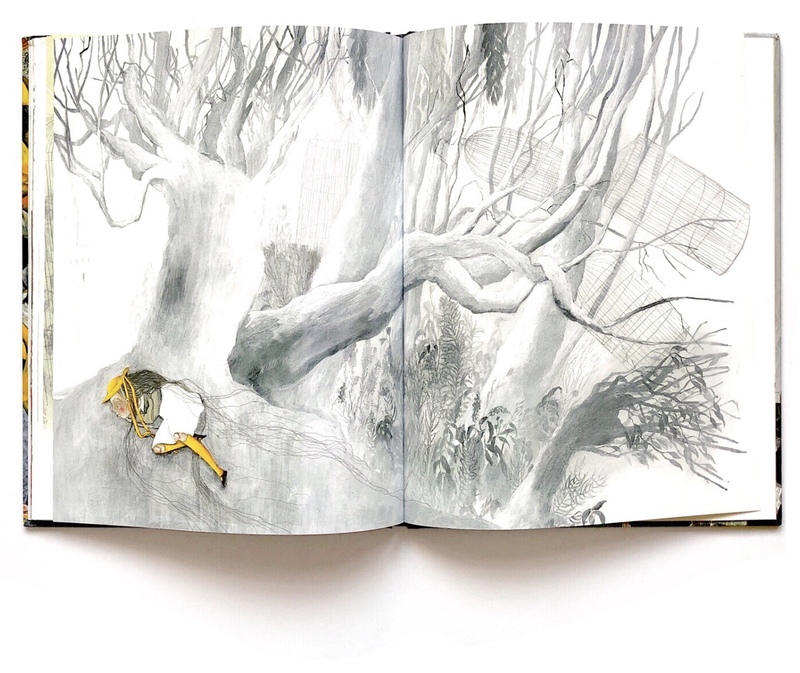 Cneut turns the unpleasant, cruel child depicted in Anna Castagnoli's story into a real, lonely girl with a deadbeat father, someone the reader can somehow sympathise with. Valentina embodies the persistent desire for new things, the impatience, the attitude to push limits, and the frustration that is common in young children as they can't often define what they want, because both imagination and language development might be involved. Making choices is also a learning process. 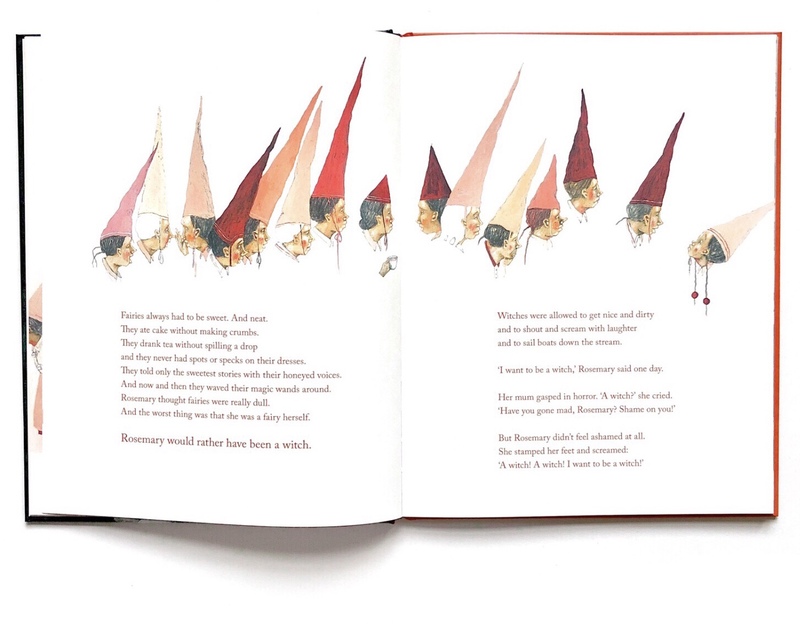 The story is punctuated by the creepy decapitation sound as Valentina's servants are brutally executed, a leitmotif repeated in handwriting throughout the text and also painted in one of the spreads. The Golden Cage is ultimately a book about patience, showing that love is not something that comes ready-made, but something that takes time, care and kindness. So we leave Valentina at the end of the book as she lies next to the cage waiting for the egg to open, her short stylish bob grown into a head long, ruffled hair, as if she had surrendered to the wait, finally growing out of her fickle, self-centred mind. 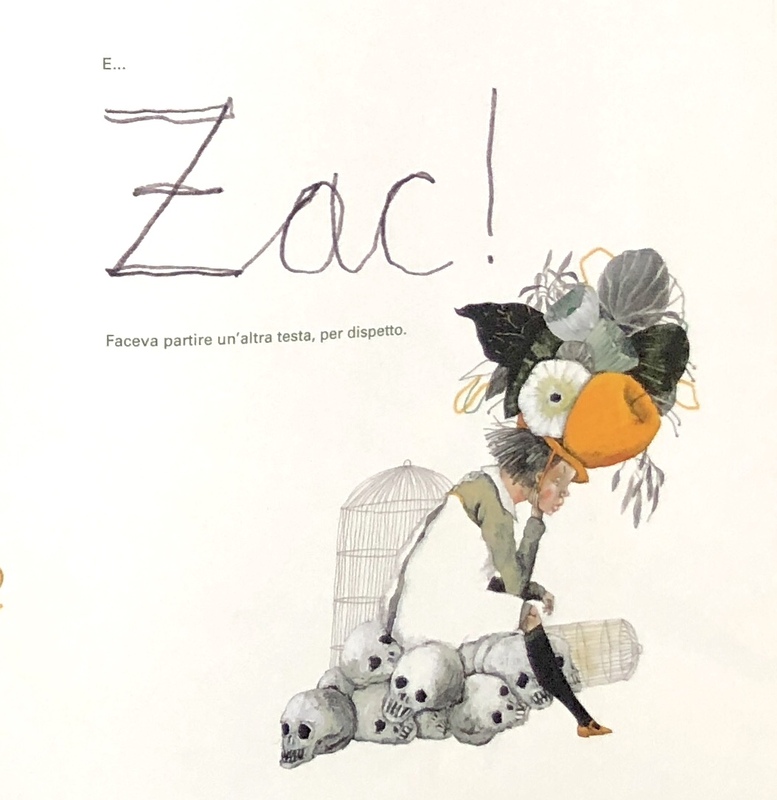 The lettering encourages a more dramatic reading by marking the rhythm and tone of voice, and works together with the illustrations to add humour to the story, as well as to invite the reader to cooperate in the construction of meaning. We see this in the white space that's abundantly left here and there, alternated to spreads bursting with colours. That white, silent space has its function too, serving as a space for the reader. 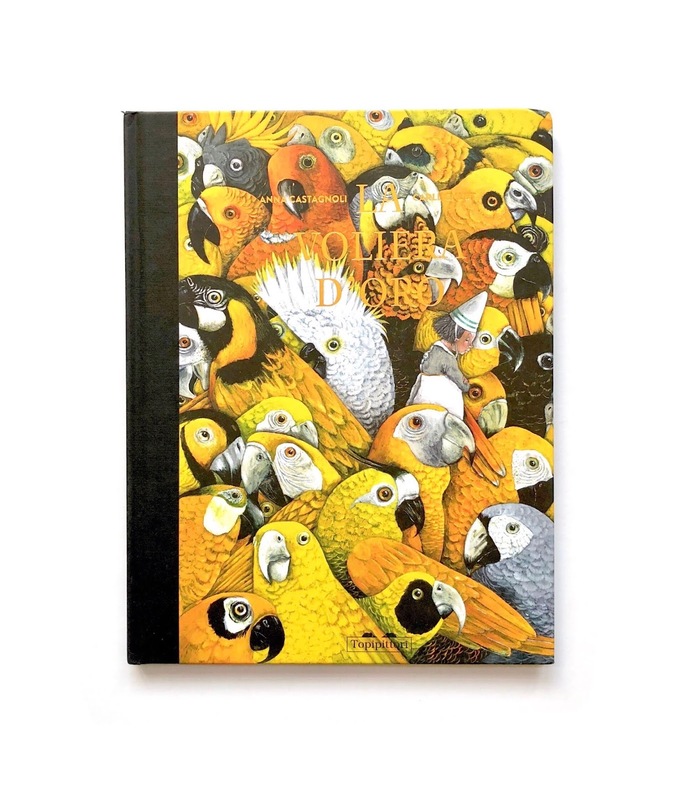 The Golden Cage is beautiful book, inside and outside: it comes in a large-format hardback edition with black cloth spine, reminding us that the book is not just a support for words and images but an object involved in the reading process. 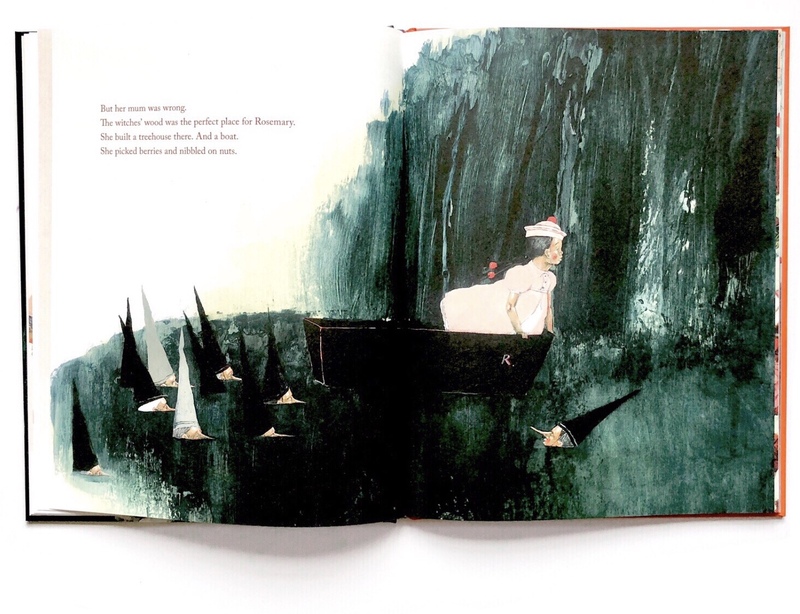 A note on the dark side of the book: the story is suitable for slightly older children (I'd say 6/7+) if compared to Witchfairy, but because of the humour which infuses both words and images, I don't feel this is a difficult story. In our case it opened up a series of curiosities and questions about monarchy, servitude and punishment. Kind of real topics. At this point the stories go together for us, and my daughter asks for 'Rosemary and Valentina' at bedtime.